Our pets, unlike ourselves, tend to eat a consistent diet – usually one to two meals per day of the same food, every day. Your pet needs to have a food that provides the full range of essential nutrients to be healthy. Dry kibble is by far the most popular method of delivering these nutrients to your dog or cat. In this article, we will tell you the truth about kibble, what you think it is, what it really is, and why quality kibble is a great choice for natural pet food. Kibble was first invented 50-60 years ago, with the intent to provide a consistent method to feed dogs and cats, and since that time, it has become the most popular choice of giving our pets the food and nutrients they require. While dry kibble as a meal may not seem to be particularly appetizing to the human palate, understanding the process of how kibble is made can help us realize why kibble dog food and kibble cat food is the best diet choice for our pets. Like most things in life, there can be huge differences in quality of products, and pet food is no exception. Several factors can affect the quality of pet food, including: 1). Experience of the nutritionist who developed the diet, 2). Quality of the raw ingredients used, 3). The manufacturer and the methods they follow to blend, cook and prepare the kibble. In order for any pet food to be sold in the US, it must state on the label if it is complete and balanced, and also whether it adheres to the AAFCO (Association of American Feed Control Officials) guidelines for the species. The formula should be developed by an experienced nutritionist who understands how various ingredients work together in combination to provide the nutrient requirements. Kibble provides convenience to pet parents to feed their pet each day, and peace of mind that their pet can be healthy by consuming the diet. When a nutritionist creates a kibble formula, they first take into account the needs of the animal, the nutrient values of the raw ingredients, and how cooking those ingredients will affect the final product. Experienced nutritionists take into account cooking temperatures, storage conditions and shelf-life timelines that retailers and consumers require for pet foods. So the formula itself, and the production process anticipate various conditions from the raw materials all the way to the end of the shelf life to ensure that your pet will have a guaranteed level of nutrition required,regardless of when the kibble is consumed within the shelf-life timeline. While understanding the manufacturing process behind making kibble is interesting, it also helps us to understand that dry kibble as a food source is not so unusual after all. In fact, if a diet was made specifically for humans, we could also be completely capable of living a healthy life eating only kibble (If it was formulated to meet human nutrient requirements (which are different from those of dogs and cats). This realization can help us understand the next important truth about kibble pet food: Not all kibble is created equal. But before we dive into how kibble can help your dog or cat thrive, let’s first cover why Lucy Pet kibble is so special. What Makes Lucy Pet Kibble So Different and Amazing? Lucy Pet is proud to work with Dr. George C. Fahey, one of the world’s leading experts in animal nutrition. Our Formulas for Life(™) diets are based on Dr. Fahey’s 40+ years experience. His extensive body of published nutrition research has established him as a bona fide expert in the pet industry worldwide. He heads our team of nutritionists to ensure our diets are precisely balanced and formulated. The beauty of Lucy Pet is the science behind out diets, so each kibble has the extensive experience of our team of nutrition experts. As we mentioned earlier, the quality of raw ingredients makes a difference. We go above and beyond to source quality ingredients such as French and USA-grown duck meat, US grown quinoa, pumpkin, sweet potatoes, wild Alaskan salmon, and more. All of our dog and cat foods are super-premium formulations, and we also offer a limited ingredient diet formula option, ideal for dogs with food sensitivities. Our ingredient approach uses natural ingredients, plus added essential vitamins and minerals plus our special Prebiotic Balanced Fiber blend for gut health. It is important to remember that no single ingredient is the most important in a pet food. Some people will hyper-focus on the first ingredient, or just the first 4-5 ingredients. While these do represent the highest percentage of the formula by weight, a dog or cat would not survive or be healthy on just those first 5 ingredients alone. In fact, it is the combination of all ingredients when digested which contribute to the total nutrient profile and quality of a food. It is very important to also understand that meat/fish protein alone does not provide all of the necessary nutrients for dogs and cats. Our kibble is formulated to provide all of the 44 essential nutrients to cats and dogs. Remember that pet food ingredients are designed to work in combination so your dog or cat gets nutritional value throughout the digestion and absorption process. This is one reason why it is so dangerous to feed your pet table scraps or home-cook, your pet will not get all of the essential nutrients for their health. By using expert designed, science-based formulas, with whole, fresh ingredients to make our kibble, we ensure that the pet food not only offers your dog or cat the wide array of essential nutrients needed for their health, and also tastes great. Our ingredients are carefully chosen by an experienced expert who has built relationships over the years with trusted suppliers. Our ingredient team has visited and checks the places where many ingredients are farmed, grown or sourced, such as pumpkin patches and quinoa fields in California. We use these local ingredients in our Salmon, Pumpkin and Quinoa Formula and Duck, Pumpkin and Quinoa kibble diets. These ingredients in combination with the rest of the formula provide all of the required nutrients, including our special blend of prebiotic fibers and proteins that promote a healthy digestive system. Quinoa, an ingredient not commonly found in dog kibble is an excellent source of healthy proteins, amino acids, fiber and energy. It helps to keep your dog or cat feeling great, with great looking skin and coat too. 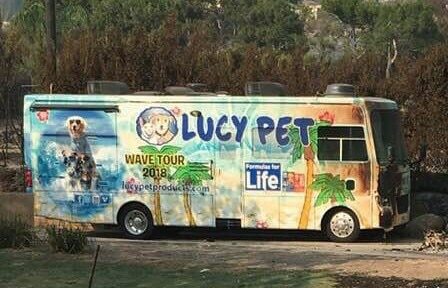 Lucy Pet foods can’t be made just anywhere. While there are lots of places that produce pet food, not all will meet our specifications, or allow Lucy Pet to inspect and set our requirements. That’s why we only make our foods at certain plants, and also rely on our nutrition experts, including Dr. George C. Fahey for input as to who makes our food. It is no accident that our kibble is packed with nutrients and health benefits. Dr. George C. Fahey and our team of nutrition experts formulated our recipes with the specific goal to focus on creating better gut health. Science shows that a healthy gut is the key to overall better health and the first line of defence to fight disease. Our kibble includes beneficial ingredients for digestive gut health that other kibble do not have. One such example is our trademarked “P.B.F.” Prebiotic Balanced Fiber™, which is a special blend only used by Lucy Pet that helps your pet achieve the optimal balance of bacteria in their digestive tract. Prebiotic Balanced Fiber™ is a creation which is based on 40 years of experience and research by Dr. George C. Fahey at the University of Illinois. All pet foods have fiber in their formula. However, they do not have our specific P.B.F. Prebiotic Balanced Fiber blend created by Dr. George C. Fahey after years of proven research. In addition to our P.B.F. blend, all Lucy Pet kibble includes the necessary vitamins and minerals to ensure your dog or cat gets the consistent, nutrition required to thrive and live a long, healthy life. Furthermore, the superfood ingredients found in all of our dog and cat kibble contribute to a stronger immune system, which is the first line of defense against viruses and diseases. Plus, the Omega-3 fatty acids we provide guarantee fantastic skin and coat health. Lucy Pet’s kibble is so healthy your pet will feel and look great in no time at all. Dogs and cats absolutely love Lucy Pet kibble. When you feed your pet a super premium, high quality Kibble dog food with delicious and nutritious ingredients like wild Alaskan salmon or premium US and French duck meat, those kinds of quality proteins make a difference in the taste. Plus our kibble formulas use quality duck fat or chicken fat, which provides energy, quality Omega-3 fatty acids, and makes our kibble smell great so they are sure to be excited to eat at every meal. Your pets want real ingredients that they can taste, and with Lucy Pet kibble, that is exactly what they get. One major benefits of kibble dog food and cat food is that is that it is highly convenient to you the pet parent. From buying, transporting, handling and measuring it out at feeding time, kibble is the most convenient option to feed your pet. Kibble is packaged in sturdy bags which are easy to transport and store in your home. Since kibble is cooked, it is safe to handle (although is always good practice to wash your hands anytime you handle any food). Furthermore, when traveling, pet owners can easily measure out the amount of kibble they will need for the duration of the trip, and store it in a secondary container. The way kibble is made ensures that from kibble to kibble your pet will get consistent, balanced nutrition in every bite. This is a MAJOR difference from some of those “fad diets” you hear about, such as raw, dehydrated or even homemade diets. Studies continue to prove conclusively that kibble provides complete and balanced nutrition consistently. There is significant variability in nutrient consistency among raw, dehydrated and homemade diets, not to mention they can be messy, unsafe, expensive and time-consuming. Since kibble pet food is cooked and dry, it is very shelf-stable. Once a bag is opened, the kibble can be placed in a sealed container which maintains the freshness of the product, prevents pests from getting into the kibble, and ensures that the kibble will continue to taste great to your dog or cat for weeks to come. Lucy Pet’s high-quality kibble is naturally preserved for the optimal health. It also is a safer, more consistent nutritious option when comparing the consumption of a raw vs. kibble diet. Remember that nutritionists formulate the recipe to account for cooking and shelf life, so the nutrition is exactly what your pet will require. It is a marketing myth created by the raw/dehydrated food companies who claim that kibble “cooks all the nutrients are out” This is simply not true. Think about it this way, we as humans cook most of our food, which provides the nutrients we need to live and be healthy. A roasted turkey or chicken is still nutritious even after cooking at 350 degrees for several hours. So, the excuse that kibble is “cooked” is not a sensible reason to avoid feeding kibble. It is important to understand costs of having a pet. From annual vet check-up visits and pet care while you are away, to emergency medical expenses and everything in between, the cost of caring for a pet can add up quickly. Of all the expenses associated with caring for a pet, pet food may be expensive but it is the single most important choice you can make for your pet’s health and lifespan. Kibble pet food is unequivocally the best option for pet parents. Follow feeding guidelines on the bag for your pet’s age, weight and health condition, and avoid over feeding, once your pet is an adult and especially over age seven, when some pets become overweight due to a less active lifestyle as they age. 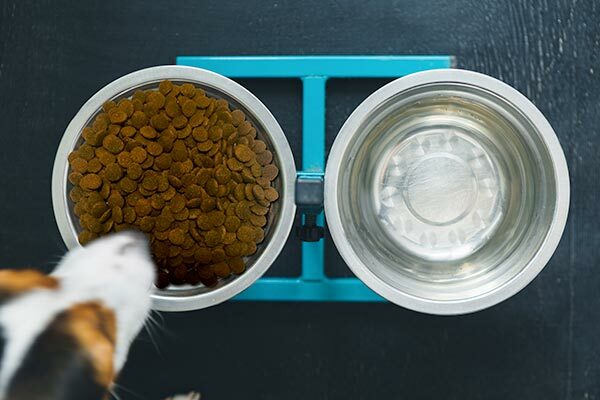 Kibble provides a mess-free solution to mealtime. Since the food is dry, any pieces that spill out of the bowl can simply be picked up without any further cleanup necessary. Raw pet food, has a strong smell and can create an unpleasant mess if it escapes the bowl. Raw food may also be unsafe to handle, yet kibble is easy to clean up and has very low-odor. Plus, kibble can be stored anywhere in the home, eliminating the need to refrigerate smelly leftover portions of wet dog or cat food in our kitchens. It is always best to tightly seal the pet food kibble bag, or store it in an airtight container. This helps keep it fresh and keeps ants away too. Now that we understand why kibble is the superior option when it comes to pet food, let’s dive a bit more into the Lucy Pet difference. 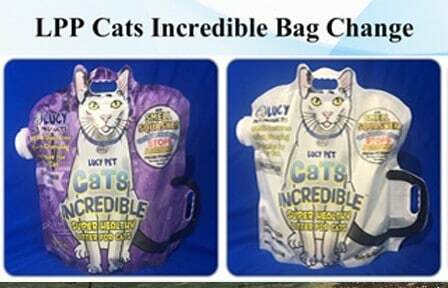 Lucy Pet makes the highest quality pet food on the market. We offer grain-free pet food and limited ingredient diet options to choose from. Our kibble formulas are precisely formulated to include the right balance of ingredients with nutrients for your pet’s optimal health. All of our kibble dog and cat foods are crafted by leading experts in digestion and nutrition to ensure optimal digestion, immunity, skin and coat health, and energy. Plus, our kibble is easy to eat for even the smallest furry friends and is recommended for all breeds of cats and dogs. Now that you know the truth about kibble, check out our selection of premium grain-free dog and cat kibble that your pet is sure to love!